This example is from MyConcertList creator's account. Culture Factory is a polyvalent venue for culture produtcion. It consists of three halls which can function separately or be merged into one entity. Mali pogon – up to 300 visitors Studio – up to 250 visitors Veliki pogon – up to 1800 visitors Culture Factory, with its new rearrangement, has become technical and production-based best equipped club in Croatia, and, in the opinion of professionals, the club with the best quality of sound because of its isolation and trapezoidal hall. The new equipment (sound system and lightning) has been handpicked to meet most band “riders” of every major band for this type of club. Norman is professional class DJ that knows how to make a party. Unfortunately, other artists felt just average in a comparison with him at that event (excluding Sara at techno stage). They used WEM PA-system and had a kind of "sensorround" system in the hall and after the intermission the sound was just amazing fantastic. I was security on the crash barrier. It rocked!!! I was there and saw MK drink something out of a JD bottle on stage. Maybe it was JD? My first Nick Cave concert and definitely not last. It was amazing. First concert I ever went to Saxon were the support band Motorhead were so loud I couldn't hear a thing for 3 days toilets were destroyed no wonder it was the last ever concert at the ABC cinema ! 90 people. A midget. Dio's future band. Motorhead at 129 decibels. 2 blocks from my house. What's not to like? I was there. 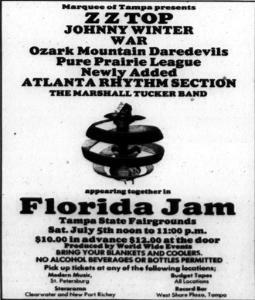 Tampa State Fairgrounds. Tickets were $10. 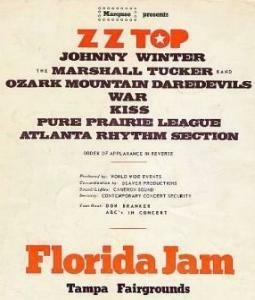 ZZ Top, Johnny Winter, Marshall Tucker, Ozark Mountain Daredevils, Atlanta Rhythm Section, Pure Prairie League, War & Kiss. (Kiss was pretty unknown outside NYC at that time) It was a southern rock era concert but War and Kiss were there. Very hot temp wise. It was announced that crowd was around 45,000 and they kept announcing what the bad drugs looked like that were being sold there. Best concert I ever saw out of many. 10th row seats on the floor - PJ was playing when they opened the doors. Pearl Jam, Smashing Pumpkins and Red Hot Chili Peppers. This was not the best performance from Metallica, but there were a couple of very interesting things about this one that made it special. It was at the height of Metallica's popularity. There were a couple hundred thousand people there, basically general admission with 21+ on one side and -21 on the other. The party out in the parking lot was just as much fun as the concert. Metallica played an acoustic set starting around the half way point of the show. Maybe not the best idea for a crowd that large, but it was still fun. The lines were brutal, and it took several hours to get out of the parking lot, but everyone you knew was there. This was one of the loudest shows I have ever seen. I remember Lemmy asking if he should turn it up and because I was directly in front of a speaker I was the only one saying NO. Needless to say they turned up the volume and I had a ringing in my ears for 3 days. I'll never forget it! Fell hard for him and love him to this day. Brill gig from the classic line up. Best concert Ive been to!